SMSF or Self Invested Personal Pensions (SIPPs): setting up and running themCheapest online supermarket shopping: Coles Online or Woolworths Homeshop? Supermarket expenses account for about 16% of our annual household expenditure for our family of 4 (2 adults, 2 children excluding mortgage costs). In cash terms, roughly $25,000 per year, and the second highest category of expenditure in the household after childcare. The Australian competition regulator, the ACCC, in an enquiry last year (2008) identified groceries as representing 12-14% of the average household’s after tax income. The price of supermarket goods year-in year-out therefore has a quite significant impact on household savings. Whilst there are new entrants coming in like Costco and Aldi the ACCC still considers the market ‘workably competitive’ but notes in its July 2008 report that there are “limited incentives for Coles and Woolworths to compete aggressively on price”. The increasingly sophisticated nature of Coles and Woolworths online shopping operations means you can monitor comparative pricing for the basket of groceries your particular home normally buys. This is because both online websites enable you to save a ‘shopping basket’ of regular items. You can also see on the sites when goods are ‘on special’. Unlike physically visiting a supermarket it doesn’t make a lot of difference to an online buyer where the food comes from e.g. you don’t have to understand the store layout and you basically don’t care whether the food has to travel 5 kilometres or 15 kilometres to get to you. So some concerns that have been raised about the limitations of the government’s ‘Grocery Watch’ price monitoring may not apply to online shopping so much. Basically if you’re willing to recreate your normal shopping basket on “the other supermarket’s website” it’s easy to switch (and in our experience it may take you a couple of hours to do this once you print out your list and re-enter each item). Who is really cheaper: Coles Online or Woolworths Homeshop? The results from our household basket of about 54 branded items based on our last 6 months purchases (the absolutely identical item from both supermarket chains that you can find at the bottom of this article) was that although more of the items were slightly cheaper at Woolworths the difference was so marginal that it’s not worth worrying about (the average item price difference across the two supermarkets was less than 1%). 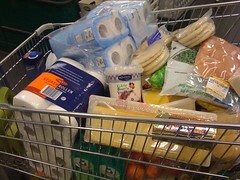 In the end our 54 item basket came out at $334 at Woolworths and $333 at Coles (see below). However if one takes into account the delivery charges for the two chains (the minimum delivery charge at Woolworths is currently $5 and at Coles it’s $9) it all comes out almost identical again. Are all online products similarly priced though? Despite the list below which suggests an average individual price difference of less than 1% (we’re sure the supermarkets themselves monitor eachother closely which may account for this extremely close pricing) we suspect that not all pricing is so equal. Our list was based on absolutely identical products. What we could not easily comparatively price, were goods like own-branded goods, and we’re sure the supermarkets are aware of this in the assumptions they make themselves about organisations like the ACCC trying compare their prices or even many individual shoppers comparing pricing. You need to check this with your own household basket and we suggest bread, milk, and salad may be where you find some of these more extreme differences (just don’t assume they apply across your whole groceries basket). Are online supermarket shopping prices more expensive than in-store prices? We have not validated this assertion about identical instore/online pricing (subject to ‘local’ variations) by checking Woolworths dockets versus their online pricing. However we have looked at Coles docket pricing from our local Coles versus their online operation and there did appear to be some signficant differences (see the Online v Instore column in the table below) with items like bread and butter and pasta and yoghurt between 8% and 18% cheaper in-store than via Coles Online (in fact any items we directly compared, albeit on a small sample, the online pricing was always more expensive). We’d be interested to hear what you’ve found! The online prices are consistently higher than supermarket prices for both stores and they will use the excuse noted in their reply to your enquiry “Not all supermarkets charge the same prices in each store for all items, therefore the prices online may differ to that of your local Woolworths supermarket.” I think until they charge the same price in all areas you will never be able to accurately compare prices. I think it will be mainly used by the time poor rich. Low socio economic groups will not be able to afford to pay the higher prices and delivery, even the money saved on specials will be gobbled up by the delivery fee. I guess that’s the price you have to pay for convenience, great if you can afford it, and we wouldn’t want to cut into the billions of dollars of profit these monopolising corporations make now would we. Interesting article in the Australian business section today. Suggesting that many supermarket chains are likely to halve the number of distinct product lines they carry, and that the impact of this will be to make them more profitable. I wonder if your study were to look at how people tend to buy the same goods over time and how these trend up or down with seasonal inflation. Also – how much time is spent collecting items? going to the shop? in traffic? weekend time? on petrol? car wear? etc – Depending on frequency of orders over a year – how do these costs compare to delivery charges? Yep Pepsi, I think these are really good questions. Depending on how you value your time (let’s say you think a shopping trip is a 2 hour exercise and you reckon your time is worth somewhere between $10 and $25 an hour) the delivery charge of having something home delivered at say $10 is minor by comparison. And that’s without even thinking about car running costs – which are usually reckoned to be around 40c a kilometre in Australia for example. online shopping is way more expensive online at both woolies and coles. we have very little competition in australia so what ever we do we get ripped off. i wish the government would step in and bring these supermarket monsters back in to line. talk about being australian. i would rather shop at aldi and not get ripped off at least that is australian by being priced the same throughout the country. coles and woolies are shocking. Like powdered milk , a short while ago one could buy 1.25 kilos for about $3.98. then all of a sudden they made it into 1 kilo packs and put the price up to about$5.00 LESS BUT PRICE MUCH HIGHER . As HR also said I think you’re right that a lot of people won’t like the fact that the price difference with a bricks and mortar shop is unknown. The only thing I would add though is that my experience of Woolworths is that they actually have free delivery slots (I guess because they want to try and even out their peaks and troughs in delivery requirements). This is usually from about 3pm to 9pm if I remember correctly. If you are not time poor and can afford to be around at home for extended delivery slots you can therefore pay nothing. I was trying out the woolworths online shop and noticed the price for bulk homebrand nappies and select brand wipes was about $2 higher in each case. I called them to query and was advised that the prices were generally more expensive online!! When I suggested that it should be cheaper as they don’t have to stock stores, run the shops etc she countered that it cost them money to pick and pack the items. I thought that’s pretty ludicrus given that they also don’t have to ship them to a store and we are paying delivery to our homes etc. I think they just want to rip us off because they know they can and they hope we won’t know our in-store prices off by heart to notice the difference. I will have to shop instore as I can’t afford a possible $2 per item (approx 10%+ of the total price) extra for the convenience. Rather bloody annoyed by it really. They should have to mention that their prices are GENERALLY higher online somewhere on the website. I have a bad back, 2 children, and am also currently 8 months pregnant. My husband and I are on a low to average total income ( although I start 9 months of unpaid maternity leave next week- eek), and we have been using online shopping from both Coles and Woolies since the week they both started. All I can say is THANK GOD it exists. Overpriced or not, my life is better for having it. I have reclaimed a whole morning, I don’t have to take my kids to the shops, and I find I impulse buy a lot less online than instore. You can get free delivery at woolworths if you pick the 6 hour time frame. I prefer them to coles because of that. Also, they provide samples of items that may relate to your age group and gender which adds more value to my online shopping, IMO. I have to say that I only shop there for items that are canned / bottled. I prefer to buy fresh food like poultry , vegetables and fruits in person because you can get it at a significant discount if you go in person. I usually buy those at Coco’s or Aldi’s. I wish they had online shopping too. Oh, to add to what Louise said, I find impulse buys alot less since shopping online because I dont have to reach the counter to realise how much everything really costs. Have just spoken to Woolies online helpdesk and she confirmed prices are higher when you shop online. She said it wasn’t 5% but lower on a basket of groceries, she couldn’t confirm the percentage, but even at 5% that equates to 390.00 extra a year. I take into account petrol, time, stress with two young boys,and impulse buying i’m probably still coming out on top and I get to shop in my pjs with a glass of wine. I think that the online shopping is an interesting concept. I am considering doing it because I have no car and have to cart all my grocies home via bus or pay for a cab fare anyway. Most people in Australia take having a car for granted. I have a coles a ten minute walk up the road and if I do my shop it costs $5 or more to get a cab back to my house with all the groceries. I think that doing stuff online is great and I first heard of this from a friend who got a job doing the online homeshop for woolies. Really, it costs more the supermarket to have someone do the shop for them. You see, many do not take the cost of employing someone to do their shopping for them into account. As one lady commented, that they don’t have to stock the shelves with online shopping but that isn’t the case as the people employed to do the shopping for the consumer actually have to go round the shop after hours and retrieve the items from what I understand. I find it interesting that woolies have a window of time for deliveries which are free. I like that and I prefer woolies to coles as they have a bigger selection of generic products than coles does. I should know, I shop generic mostly as I can’t afford to pay for brand stuff being a university student. I think that I will do my shop up the road at the local coles and wheel the trolley home as I need to start saving some cash on cab fares. Believe me, every dollar does count when you are a student and also you lack time as you are having to spend so much time studying. In reality, I will probably do my shop at the dreaded coles wheel the trolley home and then take it back. Not only will is save on delivery costs or cabfares but I will be exercising aswell. Let’s face it we are a lazy society, but if life can be made easier by online shopping then it is worth it. I think that doing my shopping locally and manually bringing it home is the way to go, but when the winter weather hits with it rainy fury I might just do online shopping with woolies and do it in the free time slot. I have a good memory, and have found that the prices of various products are not that much more expensive than that of a supermarket, however let’s face it people would save even more on generic if they got it and know that the fancy colourful labelling that they buy pollutes our environment more just for us to throw it in the bin and it goes to landfill. I do my course online and think that online shopping is advantageous. There are also people who cannot drive, like those in wheel chairs or badly disabled people who can barely walk or whatever. Not too mention that the elderly would have more problems with pushing a trolley around than younger ones, although the idea of shopping online maybe more daunting to an older generation of technophobs. I say bring it on… but more competition is needed, ie: iga, aldi and all the others need to get on board I think. I also think as far as fruit, and vege is concerned and packet meat you can save more money going in person to the markets for vegies and going instore to the supermarket late in the day when meat is being marked down, this is an advantage that you do not get with online shopping. I didnt believe it so i priced 148 items 104 were cheaper. Yeh yeh i get the ‘ i hate amway thing’ but they really are cheaper online guys. Bay in Sydney and online averages 8% more…delivery is extra again! Australia really is the dumb country. And the greedy country. We sat down, last week’s docket in hand, to work out the price of our weekly shopping list online. Each item was, on average, 50c dearer. We had 50 items on our list – that’s $25/week – plus delivery! There’s no incentive for supermarkets to have people shop online. There’s no impulse buying when you’re sitting at home on the computer. It’s a money grab for the time poor – nothing more. Australian business have no interest in offering service or convenience. And they complain when people buy online overseas. Gee, I wonder why!?! Coles is trying to position itself as a variety store. Our local Coles now stocks books, DVDs and clothes. As a result, they’ve dropped several grocery items that we regularly buy. One of which there’s no alternative at all. Add to the growing shelf space of their own brand – it’s a duopoly in the making. How long until companies like Kellogs are forced out of the market? It’s disgraceful. Public transport is a joke. Tourists get ripped off and have to put up with rude and unhelpful service. We’ve always been ripped off in Australia with pricing, but it’s even more obvious now we have the internet. I spent a few months in the US earlier this year, and the cost of living is staggeringly cheaper. My sister, who lives in the US, was out here recently and was horrified by the price of groceries here. The lucky country? Hah – we’re a bunch of suckers! I was so excited to know that Woolies online is now available in our area (regional Qld). I have just finished my third order and I just love it. I usually work full time plus regular overtime and have two children – I consider my family time precious. I am currently recovering from surgery – so presently I can not push a trolley, let alone contemplate a full grocery shop. I instantly realized that most prices where 10c plus more, but there’s a ‘trolley discount’ which helps reduce this ($381.46 total order – this includes a trolley discount of $92.81). I am yet to work out how the trolley discount works. Delivery fee is sliding scale of $13 for under $100 to Nil for over $250. Our delivery guy has explained there is seperate people employed in store to pick and pack our order (that is, walk the trolley up and down the isles, etc). So I’m more than happy to have to ‘pay’ someone to do this on my behalf, whether I am well or not. That said, I only buy meat and veg if on special as I prefer to select my own (and meat online is markedly more expensive). This allows to me shop for fresh product at local market and support local farmers, etc. I have been shopping with Woolworths Online for a few weeks because I’m unable to carry my goods home and as I always shopped at Coles before, I was wondering if I could do an online with them instead. If so, how? Don’t be fooled by WW statement that online prices are similar to “metro” supermarkets. What that MEANS is their small super-convenient stores, like those in the CBD and nearby. It’s a shame Woollies can’t just be HONEST. I might pay more for delivery if the prices were basically the same as the physical store. I just don’t like being charged TWICE – just to keep the APPARENT delivery cost low. More to the point, its not transparent. I just don’t like the idea of NOT ACTUALLY KNOWING how much extra I’m being charged ON TOP of each item. If only I could know the actual DIFFERENCE – all summed up just as ONE delivery charge – I would go for it.